Entries are not in any particular order. Some entries may be duplicates (albeit with different keys). Some entries may not be used in the relevant book. (1 is an issue because I'm working through the .bib file fixing up items one by one and examining the corresponding changes in the book; at the moment I'm having to dart back and forth a lot. b) delete or, better, comment out unused entries. I would recommend bibexport script. 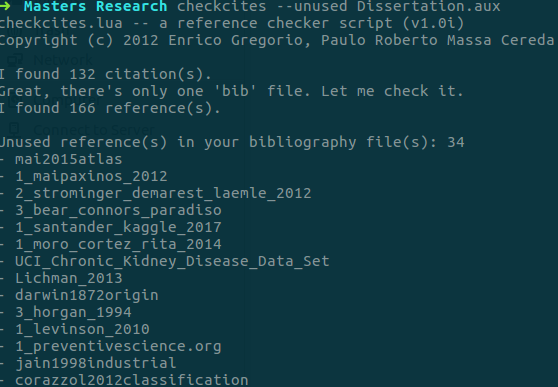 It creates a new .bib file that includes only the references you cite in the .tex file, and cleans them up. I use it for submissions to journals, when I want to send only the relevant references rather than my databases. This is a python code that automatically deal with some of these issues. Please feel free to give feedback or suggestions to enhance or extend the features of this code. Hope it can help. from os import path, access, R_OK  # W_OK for write permission. get ONE element from file f.
print "check missing files ..."
print "check double files ..."
The python script BibTeX Check helps cleaning up a bib file, though doing it not automatically but only providing a list of problems. It points to duplicate entries, missing fields, and inconsistent entries. When extending the script, it may reorder the list of entries or filter only the necessary ones. Generates and adds the labels (cite keys) to a BibTeX library file, abbreviates journal titles, filters out unneeded items, performs string replacements and checks author names for format errors that may lead to incorrect citations. And BibTool by Gerd Neugebauer can extract bibliography easily from .aux file. Again duplicates can be very easily handled using JabRef's (I am using 2.10) File --> Import into Current Database. It checks for duplicates and all duplicates can be deselected easily by using "Deselect all Duplicates" button. Right now it only sorts items with respect to the bibtex entry key. My preferred format is First-Author-Lastname. So it would sort things w.r.t author last name, assuming only that your keys are setup as such. For biber users, the bibexport script suggested in @Boris answer does not work. To make it easy to use, it runs with PHP (available and easy to install on any computer). If interested, get the script from github. A very good way to import the bib file into Mendeley desktop (https://www.mendeley.com/download-desktop/) Then select the imported references (prior to this you can import them in a separate folder) and click "Update details". Mendeley will correct the bib fields with regards to the online database. 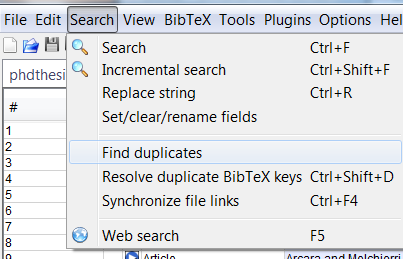 Then you can go to "Tools" and remove duplicates. Finally, export the records back to bib. Ways to check the differences between references in two bib files?